On The Street --- Well, Wall Street bets on the gold price for 2014 are in, and the table below shows where they stand. It appears that as a group, the big banks are hedging their bets because they are not overly bearish or bullish. Goldman Sachs is the most bearish with their forecast of a US$1,050 gold price by the end of the year, which would represent a decline of -12.8%. Morgan Stanley is the most bullish with a forecast of $1,313, which would represent a rise of +9% on the year. The financial press has spun these forecasts in decisively bearish terms, which doesn’t bode well for gold ETF’s (e.g. GLD), since these investors tend to take their cue from the Wall Street analysts at the above listed banks. We’ll have more to say about this below. For their part, the gold price and the gold mining shares are showing signs of life. The chart below summarizes the current gains of the yellow metal and the mining shares since their interim bottom on or near December 19th. As you can see, gold is up roughly 5.6% over the last 20 trading days, while the mining shares have strongly leveraged gold’s gains. They are up between 14% and 27% on average. Although this short-term performance doesn’t tell us much about how the year will end, it’s a healthy start to the New Year. By comparison, the gold sector is outpacing the major US stock indexes significantly. Despite setting all-time records recently, the Dow, S&P500, and Nasdaq are up only 1.6% to 3.4% over the same 20 trading days. It will be interesting to see how this battle unfolds during the remainder of the year. News out of China continues to confirm the theme that they are working aggressively to develop the world’s most prominent gold market. The country ended 2013 as the world’s largest gold importer having taken over the number one spot from India. Net gold imports to the Mainland from Hong Kong alone will likely be over 1,100 metric tonnes. To get a sense of the trajectory of gold demand, that’s a 97% increase over 2012 net imports of 557.5 tonnes and a 190% increase over 2011 net imports of 379.6 tonnes. However, this understates the physical demand for gold from China significantly. Hong Kong is typically treated as though it is not part of China by writers covering the gold market. Therefore, the focus tends to be on gold exports from Hong Kong to the Mainland rather than net gold imports into Hong Kong. Nevertheless, we can assure you that although Hong Kong is considered a Special Administrative Region, it is still very much a part of China. Thus, if we step back and take a look at the big picture, as shown in the chart below, it is evident that the 2013 gold import profile for China is very much larger than 1,100 tonnes. The red in the above chart represents the 1,100 tonnes that has been imported into the Mainland from Hong Kong. However, the gold portion of the bars represents the amount of gold that was imported into Hong Kong from the rest of the world and remained in Hong Kong. The small dark blue band represents the tiny fraction of gold imports into Hong Kong that were subsequently exported to other countries. 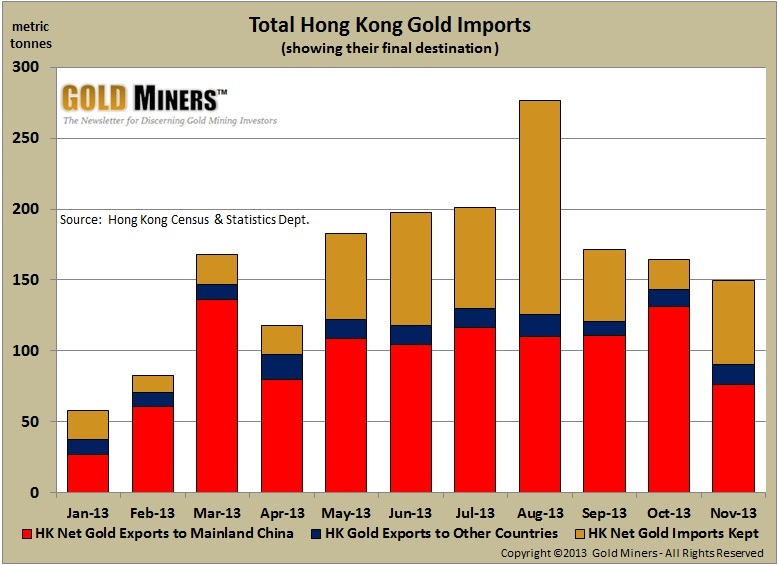 Thus net gold imports into Hong Kong for 2013, including the amount subsequently exported to Mainland China, will likely be in excess of 1,750 tonne once the December numbers are published. To put this in perspective, total mined supply from the rest of the world, excluding production from China itself, is roughly 2,400 tonnes. This means that Hong Kong effectively took delivery of physical gold equivalent to roughly 73% of the world’s 2013 gold production! It’s important for investors to let this little nugget of truth sink in. It is peculiar how this is rarely, if ever, discussed by the western financial press as a demand factor that just might impact the price of gold, but that’s another story. China itself is the world’s largest gold producer by a very large margin, and when the final numbers come in for 2013 they will likely be close to 440 tonnes. For context, Australia is in a distant second with production in the vicinity of 250 tonnes. As far as we can tell, China does not export any of this domestic gold production. The total gold import picture is probably even larger still. As we discussed in our November 22nd article entitled “Just When You Thought It Couldn’t Get Any Bigger”, China is reported to be importing gold directly into Shanghai as well. According to Bloomberg, the Chinese central bank (aka the People’s Bank of China) has been the recipient of a sizeable chunk of China’s gold imports over the last several years. Chinese authorities last reported official reserves of 1,054 tonnes in April 2009. Now a Bloomberg analyst has suggested that these reserves have grown to 2,710 tonnes. If true, this would represent a 76% increase in official gold reserves and place China in 3rd place behind only the US (8,133t) and Germany (3,391t). China has not confirmed this figure but we suspect the true total is much higher. Additionally, current reports out of China suggest that consumer gold demand remains robust as the Chinese New Year approaches on January 31st. The bottom line is that Chinese gold demand will play a significant role in how gold performs in 2014. In a further sign that their gold market development initiatives remain on track, it was reported last week that the government has granted import licenses to two foreign banks for the first time ever. The banks are ANZ and HSBC who have long been major foreign banks in China. This step serves to expand domestic gold distribution and more such licenses are expected in the future. India is the big question mark on the demand side of the gold market for 2014. As readers are probably aware, India and China are in a category all their own when it comes to the sheer size of their gold appetites. 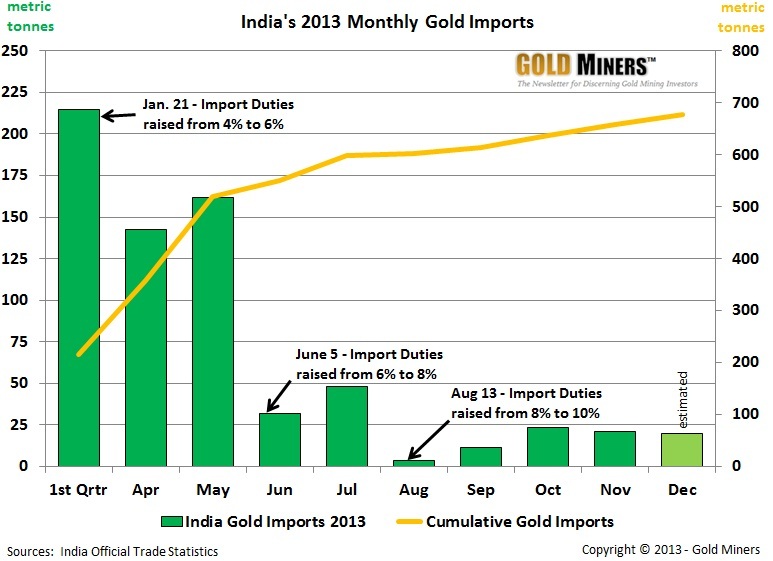 In the early part of 2013, India was on track to reach record gold import numbers right along with China. By the end of May, they had imported an unprecedented 520 tonnes of gold. Had this pace continued, they would have surpassed record levels above 1,000 tonnes in lockstep with China. However, Indian imports fell off sharply in the latter half of the year, after the Indian government implemented draconian import duties and other restrictions on the yellow metal. As a result, between June and November, gold imports fell to roughly 140 tonnes for the period, and December figures will likely only add another 20 tonnes to that figure. Domestic demand remains robust as reflected by high premiums being paid over the international spot price of gold. These conditions have breathed life into the age-old practice of gold smuggling on a large scale. Exact numbers are impossible to track but estimates place the figure at between 100 to 200 tonnes for the year. Although the government hasn’t reduced the 10% tariff on gold imports, it has begun reducing some import restrictions. They continue to float the idea of rolling back the restrictive regulations as soon as possible, depending on the outcome of efforts to stabilize a faltering Rupee and shrink the size of a negative balance of trade. It is also an election year in India and Narendra Modi, the head of India’s leading opposition party, appears to be the frontrunner. He has a strong reputation of sound governance and above average economic growth in Gujarat state where he has governed for the past 13 years. He also has a business background and is known to be pro-gold. The elections will be held mid-year and should he win, it is possible his government would take quick action to remove the shackles that have been placed on gold imports. The restoration of gargantuan Indian demand would put them in direct competition with China to secure the relatively limited supply available on world markets, given China’s greatly expanded import profile outlined above. For gold investors, this is a story worth keeping tabs on as the year unfolds. Much like now, in early 2013, Wall Street analysts and journalists were uniformly bearish on gold. They wrote about it in the press and talked about it on news programs. This begs the question; did the gold price collapse because of underlying supply and demand fundamentals or because of consistently bearish sentiment from Wall Street? The question is especially relevant when talking about ETF investors. It is very conspicuous that ETF investors in the west were the only gold market participants selling gold in 2013. All other categories of demand were net buyers, including central banks and consumers. When 2013 began, Chinese physical demand was surging to record levels. In January, February, and March, net imports into Hong Kong were 47, 73, and 157 tonnes respectively (see Hong Kong gold imports chart above). In other words, gold imports tripled in just 3 months ending March at an unprecedented level of 157 tonnes. If you projected the same level of imports for the remainder of the year you would have arrived at an eye-watering figure of 1,691 tonnes. At the same time, India was continuing its trend of historic levels of gold demand from the prior year. In 2012, they imported 800 tonnes of gold. As of the end of March 2013, it was averaging 70 tonnes per month over the first 3 months of the year. Annualizing this figure at the time would have yielded a forecast of 840 tonnes or a 5% increase over 2011. This begs the question, in light of robust and historic demand coming out of Asia during the 1st quarter of 2013, why would ETF investors suddenly decide to sell-off in historic fashion on two unforgettable trading days in the following April? The event that started the stampede was no less peculiar. As was reported at the time, on April 12th a Wall Street bank, rumored to be Morgan Stanley, sold a gargantuan amount of gold futures contracts within a 30 minute timespan in the early morning hours on the Comex. The size of the trade represented 300 tonnes of gold or 15% of global mined supply. This began a stampede out of the gold ETF’s over the course of 2 days that would cause a 13% swan dive in the gold price. Of course, the Wall Street explanation of these events was, and continues to be, that investors have abandoned gold due to the improving economic conditions in the US specifically and around the world in general. However, this explanation simply does not square with the facts just cited. ETF investors appear hopelessly out of touch with supply and demand fundamentals in the physical gold market. In our opinion, the narrative coming out of Wall Street plays a major role in this confusion. Nevertheless, ETF activity has a major impact on the price of gold. Therefore, gold investors must take their performance into consideration. According to Bloomberg, ETF inventories reached an all-time high of 2,620 tonnes in late 2012. Since that time, they have hemorrhaged an astonishing 33.4% (874t) of their gold holdings, leaving a greatly reduced inventory of 1,746 tonnes as of January 10th. In this context, it bears repeating. Why would gold ETF investors, who presumably were looking to profit from owning ETF shares, sell a massive 874t of gold at a time when demand from Asia was surging to historic levels and thus likely to provide them with the profit they sought? We will leave it for you to ponder. ETF inventories continue to decline, although at a greatly reduced pace than during the epic waterfall moments of 2013. Thus the major question for 2014 is whether ETF investors will make any significant moves in a bullish or bearish direction during the year? The answer to this question could well be the key to gold’s performance in 2014. As a final note, we expect central banks around the world to remain bullish and thus net buyers in 2014. The final numbers for 2013 will likely be somewhere between 350 and 450 tonnes. The reason for their continued bullish posture is due to uncertainty hanging over the international monetary system fueled by continuing QE experiments primarily by the US and Japan. As a result, central banks around the world are mitigating the risk to their foreign exchange reserves by stocking up on gold. Our discussion above should help provide readers with some perspective on the significant issues in play for the gold in 2014. It could easily be an explosive year if Indian demand reenters the global market and ETF investors turn bullish, or at least cease to be bearish. There are many catalysts that could potentially turn ETF investors bullish. These include things like revelations on Thursday by Germany’s top financial regulator that possible manipulation of the gold price by the big banks is worse than the recent Libor-rigging scandal. In terms of the downside, it is interesting to note that even the neutral Wall Street prognostications mentioned earlier suggest we are at or near the bottom. 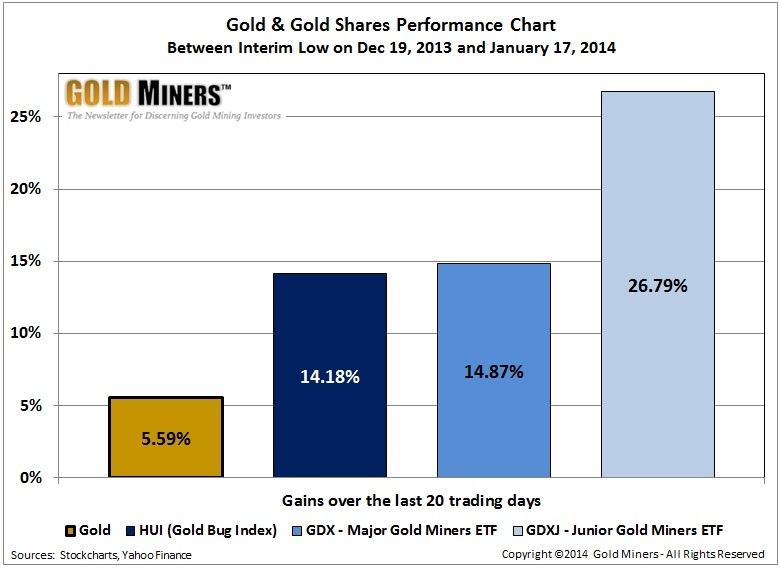 In sharp contrast, gold and the gold mining shares are up sharply to start the year. In the meantime, difficulties in the gold mining industry, made manifest by the low gold price environment, continue to discourage investors. As a result, valuations remain at extreme lows. From our perspective this represents a rare, and potentially brief, window of opportunity to buy the stronger miners that are poised for growth at historically undervalued levels. We are persuaded that this is the case for two fundamental reasons. The first is because we believe that supply and demand fundamentals remain wildly bullish for gold over the medium to long-term. Secondly, we are convinced that the gold mining industry is undergoing a much needed transformation. This will leave it leaner and meaner over the course of the next 18 to 24 months, just in time to leverage a rising gold price. We may have to hold our shares awhile but you can’t beat the current price. And buying the strongest companies at extreme lows is one of the best ways to mitigate the high-risk inherent in mining. Our Comparative Analysis Table represents an abbreviated version of some of the metrics we use to compare miners for investment purposes. You can find it by navigating to the version of this article posted on our website on the Weeklies page. Additionally, our Model Portfolio, available to paying subscribers, identifies the gold miners most likely to outperform as the price of gold rises.